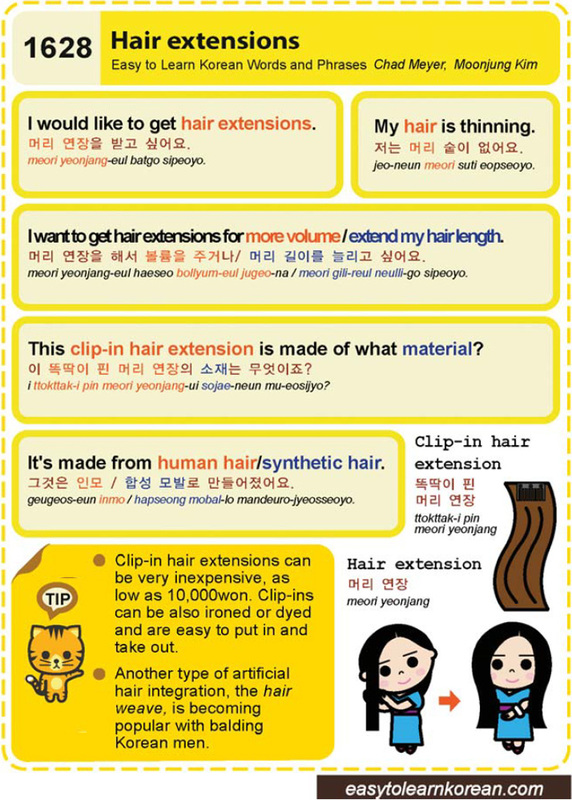 Easy to Learn Korean 1628 – Hair Extensions. This entry was posted in Series and tagged artificial hair integration, bald, balding, balding men, Clip-in hair extension, hair extensions, I want to get hair extensions for more volume / extend my hair length., I would like to get hair extensions., It's made from human hair/synthetic hair., My hair is thinning., the hair weave, This clip-in hair extension is made of what material?, 그것은 인모 / 합성 모발로 만들어졌어요., 똑딱이 핀 머리 연장, 머리 연장, 머리 연장을 받고 싶어요., 머리 연장을 해서 볼륨을 주거나/ 머리 길이를 늘리고 싶어요., 이 똑딱이 핀 머리 연장의 소재는 무엇이죠?, 저는 머리 숱이 없어요. by easykorean. Bookmark the permalink.